For decades I thought that my homemade compost, mulches, cover crops and judicious use of organic fertilizers were adequate to keep my vegetables supplied with micronutrients, also called trace elements. Essential micronutrients in soil including manganese, boron, zinc and iron are naturally present in soil that is rich in organic matter, and plants need them only in minuscule amounts. I assumed my plants had plenty. Then came this lesson. One summer my Brussels sprouts were in distress for no apparent reason, so I decided to give them a little boron, having read that boron deficiency in plants is not uncommon in my area. The results were dramatic. Within 24 hours after being drenched with 1 tablespoon household borax dissolved in a gallon of water, the plants relaxed their slightly cupped leaves, regained their color, and looked healthy and ready to grow. Applying boron to the leaves corrected a deficiency for these Brussels sprouts. Scientists have studied interactions between plants and trace elements in soil for 80 years, and early on they discovered that one plant’s blessing can be another plant’s curse. For example, while it might be good to treat boron deficiency in plants like broccoli, Brussels sprouts, beets and turnips, too much boron is toxic to beans, peas and cucumbers. Indeed, the reason I bought the borax in the first place was to use it as a selective herbicide on the weed known as ground ivy or creeping charlie (Glechoma), which had colonized an ornamental bed. Ground ivy sap causes an itchy rash for many people, so pulling it out is not without risk. Having heard that ground ivy was hyper-sensitive to boron, I sprayed it with borax in water, and it worked. Three weeks later the ground ivy was gone and my cultivated groundcovers were thriving. Micronutrients can be powerful tools, but a little goes a long way, and you must be careful. A little boron saved my Brussels sprouts, but the same treatment would have been a disaster for boron-sensitive peas. The box below lists vegetables that usually respond favorably to supplemental boron, and those that are harmed by small amounts. Beets often respond favorably to a boost in trace elements in the soil. Like boron, manganese is normally a micronutrient in soil, but it also can be absorbed by leaves. Some soils hold less manganese than others, and manganese deficiencies can develop when too much lime is applied to acidic soil. Plants suffering from manganese deficiency simply fail to thrive, and often show yellowing between leaf veins. Always check your soil’s pH before considering a manganese supplement, which should not be applied unless the pH is above 6.0. Under more acidic soil conditions, manganese becomes toxic. Also pay close attention to the crop in need of help, because not all vegetables have a taste for manganese. Should you decide to try a remedy, you can probably find manganese tablets or capsules, sold as nutritional supplements at pharmacies, more easily than agricultural products used to treat large areas. Potency varies with product, and a good goal would be to dissolve 50mg in 2 cups water, and spray it on a test plant to see if it helps with the problem. 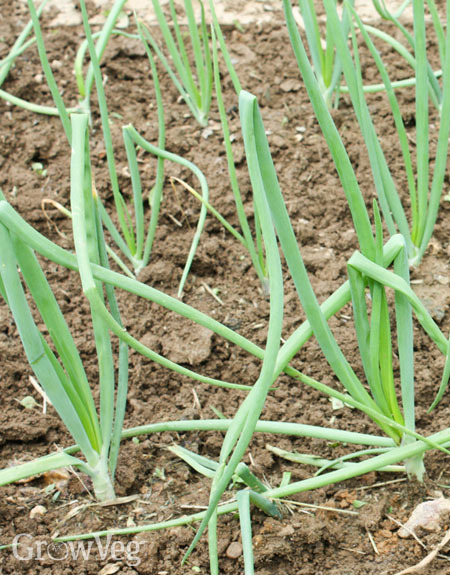 Insufficient manganese can slow the growth of onions. In alkaline soils or soils with high levels of phosphorous or calcium, plants can develop iron chlorosis, where leaves turn light yellow between the leaf veins, especially on new growth. Shrubs, trees, grasses and some vegetables can be affected, including tomatoes, peppers, beans and cabbage family crops. When suffering plants are sprayed with a chelated iron spray, they quickly regain healthy green color. Alkaline soil conditions also can make it impossible for plants to take up zinc, so many iron sprays for plants also contain zinc. Crops including citrus fruits, corn, and onions often green up fast when zinc is provided, though the best long-term cure is to use compost and mulches to support strong growth of soil fungi, the life forms responsible for replenishing the soil’s zinc supply. Which brings us back to my well-founded belief, documented in numerous studies, that good organic gardening practices naturally replenish trace elements in soil. It’s just that some plants need more.